The Girl With All the Gifts: Booktrack Edition adds an immersive musical soundtrack to your audiobook listening experience! *The USA Today bestsellerMelanie is a very special girl. Dr Caldwell calls her "our little genius." Every morning, Melanie waits in her cell to be collected for class. When they come for her, Sergeant keeps his gun pointing at her while two of his people strap her into the wheelchair. She thinks they don't like her. She jokes that she won't bite, but they don't laugh. 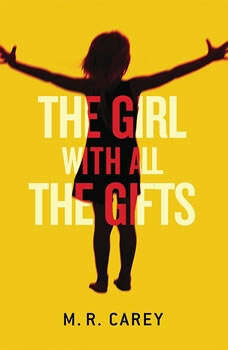 The Girl With All the Gifts is a groundbreaking thriller, emotionally charged and gripping from beginning to end. *Booktrack is an immersive format that pairs traditional audiobook narration to complementary music. The tempo and rhythm of the score are in perfect harmony with the action and characters throughout the audiobook. Gently playing in the background, the music never overpowers or distracts from the narration, so listeners can enjoy every minute. When you purchase this Booktrack edition, you receive the exact narration as the traditional audiobook available, with the addition of music throughout. David Achord presents the sixth book in his Zombie Rules series. Contains mature themes. David Achord presents the latest installment of his Zombie Rules series.